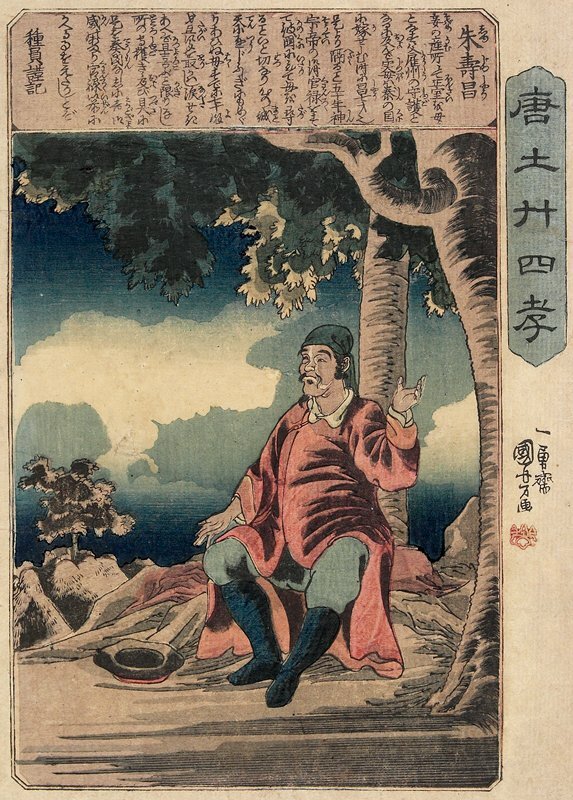 Kuniyoshi designed many prints featuring Confucian paragons. This print is from a series titled "Twenty-four Paragons of Filial Piety in China," which Kuniyoshi created in the late 1840s. He employed western perspective and chiaroscuro in a manner seen in 17th century European etchings. The rectangular cartouche contains the story of Shu Jushø (Zhu Shouchang, in Chinese), a man who searched for his mother for fifty years, having been separated from her when he was only seven years old. Kuniyohsi depicted Shu Jushø resting under a tree-thus suggesting his long, difficult quest.